​Follow Stephen as he works his bees, finds interesting things in the bee yard or catches up with some great folks at various events and even makes the news every now and then! Nucleus Colonies (or nucs) are great for getting a fast start. They are typically made up of 5 frames with a mated laying queen, brood of all ages as well as frames with honey and pollen. Frames are less than two years old and in good shape. 5 frame nucs are comprised of at least 2 frames of brood a frame of hone a frame of pollen and a frame that may be partially drawn to allow for growth. These nucs will grow fast. Available Early/mid April - $150. No frame exchange. Contact us to order. There will be NO FRAME EXCHANGE. Please contact Steve at 412.445.7872 or via email at meadowsweetbees@gmail.com to order or for questions. In you haven't purchased a copy of my new book "Swarm Essentials: Ecology, Management, Sustainability" - you can do so here. After some time spent working on putting this book together, it is finally completed and published! It is full of information on honey bee swarming biology, how to manage the swarming impulse in your colonies as a beekeeper and also how to capture and manage swarms. 128 pages. $25 available by contacting me at meadowsweetbees@gmail.com. Swarm Essentials, by Stephen J. Repasky with Lawrence John Connor, Foreword by Thomas Seeley. Let the Swarm Season Begin! Its that time of the year when honey bee colonies in Western Pennsylvania begin their process of dividing - called swarming. Honey bees are not dangerous on a regular day and while swarming they are extremely docile - they are homeless, stomachs are full of honey and they just want a place to live! I get a fair number of swarm calls every year and always look forward to them because you never know what you will see or find! My first swarm was yesterday - it was one of the most difficult swarms ive attempted to catch. It was 30 ft up on a limb! With the help of another beekeeper, i had a 9 ft tall step ladder that I stood at the top of, plus a fully extended pole pruner that was about 10 ft tall. I was still short! Long story short, i eventually got a rope around the limb, pulled it down somewhat closer, attached a bucket to the pole pruner and knocked the swarm into into the bucket. I repeated this a few more times until I got most of the bees. If this wasnt exciting enough, this was done by the light of a flashlight at 10:00pm! I placed the bees in a small nuc box and checked on them this mooring and found a good number of bees and located the queen - i could tell by her size that she was a virgin and had not been mated. Ill wait a few weeks to see if she starts laying eggs. This evening, I received a call about another swarm not far from me. This swarm was much easy and HUGE! 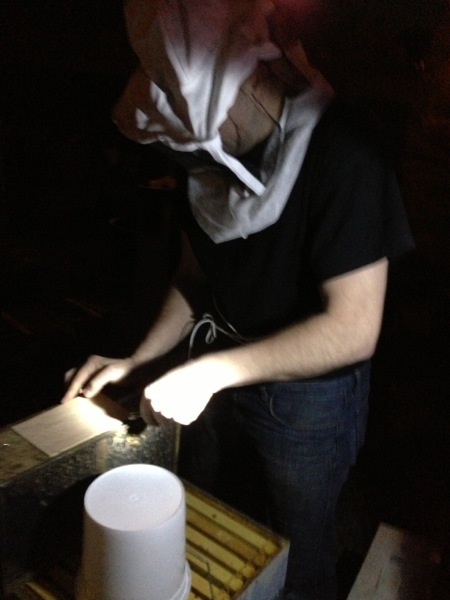 I had my mentee beekeeper, Nate Mallory with me and we were able to successfully get the swarm in the hive. This time, we needed a full size 10 frame hive to put the bees in. Its an exciting time to be a beekeeper! Less bees, higher food costs? Its true, because of the fabulous pollintation efforts of honeybees, farmers receive over $20 billion in free services (pollination) from honeybees kept by beekeepers everywhere (a majority of which have 10 hives or less [in Pennsylvania at least] ). Check out this article on a very serious issue! ......and so are the bees! On one of the first of several upcoming nice days, the worker bees (all females) get out and search for new pollen to bring back to the hive. This pollen provides the protein needed to raise brood (young bees). The colony will be growing fast and they will need it! Pollen is full of amino acids, vitamins an minerals and each type of pollen has different amounts and types of these vital nutrients! In this picture, the bright orange pollen is from crocus flowers and the lighter colored pollen may be from maple trees or the flower of skunk cabbage. Interest in Top Bar hives has grown in the last several years and there are a few folks out there who keep them in the Pittsburgh area. It’s not a common beekeeping practice, but Burgh Bees has joined with Gold Star Honeybees of Maine to put on this one time event to allow some insight of the pros and cons of top bar beekeeping and how to manage them so that you can succeed. This class will be offered with limited spaces. These classes draw folks from several states so don’t wait to register! When: March 16 and 17, 2013. 8:30am to 4:00pm with an hour lunch at noon. Where: Penn State Extension of Allegheny County. 400 Lexington Street – 3rd floor, Pittsburgh. Early bees catch the buzz, and save $25 off the $175 tuition. Early registration until March 1st. I have been very active in Burgh Bees since its beginning four years ago. One of our goals was to develop a Community Apiary where folks living in the city can have a place to keep bees. It operates much like a community garden but with Honey bees! It has been met with great success and is the very first Community Apiary in the Nation! along the way. As urban beekeeping takes off across the country, Burgh Bees hope is to inspire committed beekeepers in cities throughout the nation to follow our lead and create urban apiaries in their home towns. Burgh Bees’ initial founders in- cluded a Carnegie Mellon University MBA student, a lawyer, a corporate pilot, a Penn State University commu- nications professor and an architect with little more than 15 years of com- bined beekeeping experience among them. A year into the organization’s development, this core group was joined by a state wildlife biologist and another CMU MBA graduate, both of whom are second-generation beekeepers and also have become certified master beekeepers by the Eastern Apiculture Society. About six months later, the Director of Penn State Extension – Allegheny County joined the board. While this might seem like a uniquely impres- sive group of professionals, cities are particularly rich places to find people with a dazzling array of skills that can provide essential resources to build the kind of organization that sustains an urban apiary and the new beekeepers it will be train- ing. Though organizational skills are important, devotion is absolutely essential. America’s first community apiary is a reality only because a small group of people were dedicated to making it happen. In 2008, in its first full year being an organization, Burgh Bees founders offered a year-long beekeeping course that helped to create a strong community of “new bees” eager to work with each other and realize the dream of a community apiary. Fifty people signed up for this first class, which demonstrated a strong community interest in beekeeping. That year, Burgh Bees also began organizing monthly “meet ups.” Held at local watering holes throughout the city, the meet ups brought people together, enabled friendships to form, and made the gatherings fun and festive. Burgh Bees also received an $8,000 seed grant from The Sprout Fund, a foundation that supports innovative grassroots community projects. Those funds enabled the purchase of beekeeping equip- ment, provide educational materials for the classes, set up a website (www.burghbees.com) and obtain basic infrastructure (such as fencing) for the apiary. Early on, Burgh Bees partnered with a community garden in the city’s Hazelwood section where their first two colonies found a home. That same year, the innova- tive mayor of Braddock, PA, a small town on the outskirts of Pittsburgh, asked Burgh Bees members to remove an unmanaged colony of honey bees that had taken up resi- dence in a vacant building. He also offered space behind an old convent to place two colonies. The convent became a key site for beekeeping classes and honey extraction and the mayor’s support buoyed the organization. Pub- licity from the colony extraction in Braddock attracted interest from the horticulturists at the Pittsburgh Zoo & Aquarium. Burgh Bees placed two colonies on the zoo’s green roof and helped to train two of their staff members to keep bees. Also in 2010, Burgh Bees faced a new challenge. Pittsburgh did not have any regulations or ordinances regarding beekeeping. That year, city officials began de- veloping a new Urban Agriculture Ordinance and Burgh Bees became very involved in helping to frame the regu- lations. Through the support of many urban agriculture enthusiasts and city beekeepers, the Pittsburgh city council passed an ordinance that permitted urban bee- keeping with some limitations (these included set backs from property lines and numbers of hives allowed based on property size). In 2010, working with the City of Pittsburgh’s Urban Redevelopment Authority, the mayor’s office and City Council representatives, Burgh Bees members secured a lease for a vacant 1.5 acre lot in the city’s Homewood section. While the necessary paperwork was being com- pleted, Burgh Bees held meetings with residents of the neighborhood as well as with those interested in bees and beekeeping. These “bee curious” sessions were a means of garnering support for the organization while at the same time educating non-beekeepers about the importance of honey bees, how safe it would be to keep bees in the city and, of course, the joys of beekeeping. The concept of a community apiary is very similar to that of a community garden. A spot within the apiary is rented out to the city beekeeper on a yearly basis but the beekeeper owns, manages and is allowed to keep any and all honey harvested from that hive. harvested from that hive. Each person renting a spot is required to participate in Spring and Fall clean-up days as well as volunteer a certain number of hours at a Burgh Bees event. In March of 2010 Burgh Bees erected a six-foot high privacy fence on a 32’ x 50’ section of the 1.5 newly leased acres. Immediately, Burgh Bees moved most of its hives into the enclosed area, leaving only two hives at the Pittsburgh Zoo. America’s first urban community apiary was official! Well, almost. There was still a lot of work to do. The rest of the vacant lot was overgrown with weeds, old tires were strewn about and then there was the issue of how to get the apiary filled with beekeepers willing to keep bees in the city. In early 2010, $3,600 in funds from a Kickstarter campaign helped supply plantings, raised beds, a sign and other equipment for the apiary. Once the apiary had been established, Burgh Bees also began offering “open apiaries” (much like an “open house”) where people interested in beekeeping could learn more about this fascinating pastime. Open apiaries helped many overcome long time fears of “bees,” attracted new beekeepers to the classes and fostered a broad apprecia- tion for the honey bee for all who attended. classes prove to be as valuable to Burgh Bees as it is to the people who took them. In effect, Burgh Bees trains its own membership and helps to build the numbers of urban beekeepers in the city. In addition to the intro- duction to beekeeping course, increased demand led to adding a second year beekeeper course, as well as classes on honey harvesting, products from the hive. And work- shops on queen rearing and splitting hives are planned for the future. By 2011, the Burgh Bees Community Apiary boasted 20 new beekeepers, all graduates of Burgh Bees Bee- keeping 101 classes. Over the course of the next several months, a group of dedicated volunteers put the final touches on the apiary. Nearest the fence is typical urban landscaping that benefits pollinators with plant species such as liatris, rudbeckia, and various types of sage and mints. A large native pollinator meadow comprises the apiary complex. Volunteers planted a seed mix of 17 pollinator friendly species and as Summer progressed, a beautiful display of native flowers erupted, creating for- aging habitat not only for honey bees but also for many other species of pollinators in the area. To connect it all together a walking path in the shape of an infinity loop enables visitors to walk around and observe honey bees and other pollinators at work. Increased numbers of beekeepers led to a different type of challenge. Where do I get bees? My hive swarmed, now what? When can I harvest honey? What do I do about mites or wax months? All are common questions to the new and veteran beekeeper alike. Burgh Bees adopted a two pronged approach to meeting these needs. First, a Google Discussion Group was formed where questions like these can be asked and answered by the many bee- keepers on the list. The Google Group helps to illustrate that there is no single way to approach beekeeping, while also enabling beekeepers to share ideas. Second, by using social media, Facebook and Twit- ter accounts were established where information is dis- seminated on classes, meet-ups, hot topics in beekeeping – even passing along the location of a swarm for someone local to capture. Burgh Bees website (www.burghbees. com) adds additional resources to all those interested in honey bees. previous years, Burgh Bees received no push back from residents about beekeeping in the city. However, they experienced community resistance when they tried to de- velop an apiary of a few hives in one Pittsburgh neighbor- hood. Due to that resistance, there was a change of plans. While no harm came from this experience, it increased awareness that more focus was needed on education. As a result, Burgh Bees have stepped up informational sessions throughout the city. Establishing the nation’s first community apiary has been exciting and inspiring, but it did not happen without hard work. To call it successful is an understate- ment. Currently, Burgh Bees has nearly 200 dues paying members, has trained over 250 new beekeepers from Pennsylvania, Ohio and West Virginia, is expanding its teaching component and is working on adding a formal mentoring program to its organization. The community apiary continues to gain in popularity not only for the city honey it produces but even more importantly the educa- tional opportunities it presents. As with the community apiary in Homewood, a core group of committed beekeep- ers and volunteer community members is helping to make a second apiary a reality, creating a wave of enthusiasm and community support. The community apiary energy has even garnered the attention of a national natural handmade cosmetics company. LUSH, which has stores in 150 cities in the U.S and Canada. LUSH has gener- ously pledged $9,000 in support to begin construction of the apiary in Brookline which consists of a 50’ x 50’ fence on 1.4 acres. Local businesses are showing interest in sponsoring honey bee colonies for educational use. A waiting list is forming for those wanting to place colonies in the apiary or assist with beautifying the site. Urban community apiaries are a growing trend. With a little bit of hard work and a group of dedicated people, urban apiaries can begin buzzing in a city near you – bringing communities together, utilizing vacant space, and providing a vibrant, healthy place for honey bees, beekeepers and nonbeekeepers alike to thrive. Stephen Repasky is an EAS Master Beekeeper and Com- munity Apiary Director for Burgh Bees. He currently runs 20-30 hives in and around the city of Pittsburgh, PA. Jennifer Wood, who contributed to this article, is a founding member of Burgh Bees. She and her husband, Robert Steffes, keep bees at their home in Aliquippa, PA. Stephen can be reached at srepasky@gmail. com.